When the 1940 U.S. Census was released in digital form earlier this year, I used the 1930 Enumeration District converter by Steve Morse to begin locating grandparents and my parents. As each state was indexed in entirety, it became much easier to find relatives. Now that Ancestry has the complete 50 state index (and Familysearch is not too far behind), I wanted to see how many of my aunts and uncles I was able to find. The verdict: all but two out of 8! 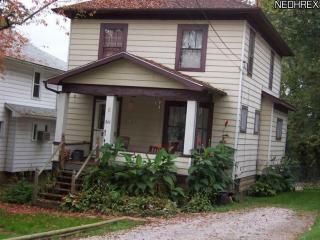 My paternal grandparents, Loyd and Ella Amore, are empty-nesters living at 1236 Vine in Tuscarawas Township in Coshocton County, Ohio. (I had previously written about this find at Census Saturday – 1940 Census Finds). Of their seven children, I located my dad and 4 of his siblings. My dad was stationed at Patterson Field (now Wright-Patterson Air Force Base) outside of Dayton, Ohio living in the Enlisted Men Barracks. His oldest sister, Gertrude, and her husband, Walter Shackelford, along with their two children resided at 611 Larzelere in Zanesville, Ohio. My dad’s other sister, Marie, and her husband Robert Werkley, are lodgers in a household at Morristown in Morris County, New Jersey. Both are involved in the Salvation Army. His brother, Paul, is living in Plymouth, Wayne County, Michigan and his other brother, Bervil, is living with his wife and family, in Jackson Township, Coshocton, Ohio. I am still looking for my dad’s other two brothers – (William) Gail Amore and Norman Edgar Amore. 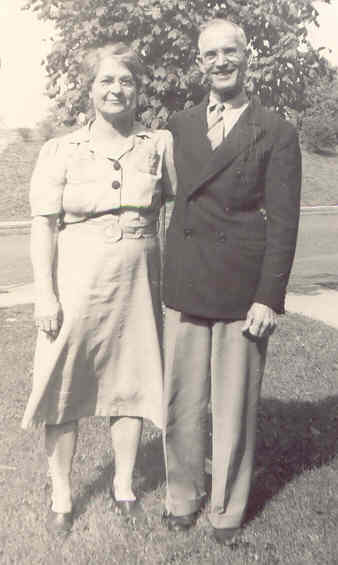 My maternal grandparents, Glen and Vesta Johnson, as well as my mother, Mary, were enumerated in Fairfield (present day Fairborn), Greene County, Ohio, living at 40 Ohio Street. Besides my grandparents and mother, occupants also include my uncle – Glen Roy Jr., and my newborn brother, Jim. My grandparents had a family of lodgers living there – the Theodore Fern family. 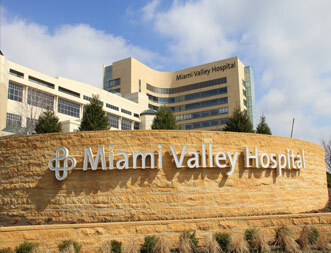 My mother’s sister, Genevieve, was found as a nursing student at Miami Valley Hospital located at 134 Apple Street in Dayton, Ohio. 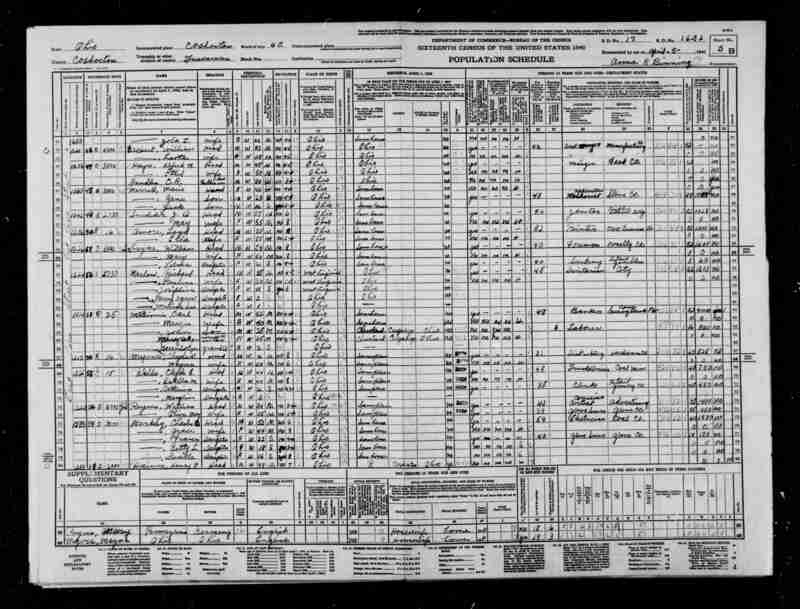 The next people on the 1940 U.S. Census who I want to find are the siblings and their children of both sets of grandparents. I’ve already made a pretty good dent in that list. I found my paternal grandparents, Loyd and Ella (House) Amore, living at 1236 E. Vine Street in Tuscarawas Township of the City of Coshocton, County of Coshocton, Ohio, in the 1940 Census. They are the only occupants of the home that they are renting for $16 a month. My grandfather, Loyd, appears to be the person who responded to the enumerator by way of a check mark at the beginning of his name. He is listed as the Head of the family and my grandmother, Ella, is listed as his wife. Both are shown to be White, and he gives his age as 58, with her age shown as 57. Grandpa was born on March 5, 1882, and Grandma was born June 22, 1882, so their ages match up. She was just a couple months away from being 58. They are shown as married. Their education was a little surprising for me. My grandfather completed the 8th grade whereas Grandma completed two years of high school. They were born in Ohio and resided in the same house in 1935. They are not living on a farm. Grandpa was at work for pay in his own business as a Painter for 32 hours during the week of March 24-30. He worked 52 weeks in 1939 for a total income of $1000 and did not receive money from other sources. My grandmother was enumerated as being at work in the home. Other than the education information, none of the answers on my grandparents’ 1940 Census surprised me. What is sad for me is knowing that this would be the last census my grandmother would be enumerated because she died of breast cancer six years later. I would never get to know her and my sister was just a baby when she passed away. My grandfather would be enumerated in one more census: 1950, before he died in February 1955. How sad that he would be listed as a widower. 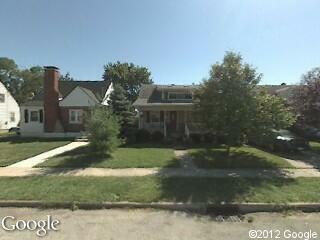 Now, if I can just locate them in the 1930 Census living at 720 S. Fifth (5th) Street in Coshocton, I’ll be all set! So many 1940 census images and so many indexers but according to FamilySearch – not enough arbitrators. I read blog posts and information about arbitration and decided I had indexed quite a bit and remained consistent at 97%-98% accurate so I dipped my toes in the water and requested to be considered as an arbitrator. Apparently, they are really desperate because I received the “right to arbitrate” about 2 hours later! When I started to arbitrate indexed census images, it looked as if Indiana was on the brink of being “searchable” (that was an erroneous perception it turns out) so I started with that state as I had plenty of collateral relatives there. Didn’t find any as I started arbitrating (I had already indexed a lot of Indiana census images). What I did find made me scratch my head. Most of the dual indices (each census image is indexed twice – the differences are then arbitrated) – were close enough to each other with minor exceptions – an “o” instead of an “a” or not paying attention that the “S” typed for “Son” turned out to be “sister”. Easy arbitration. Then came what I am calling – the indexers who apparently do not read any instructions. If there is not a dwelling number, instead of viewing the previous page to see what the dwelling number is, the indexer put <blank>. Really? Seriously? Or how about a place lived five years previous for a child who is only 2? Really? Seriously? I’ve even found a <blank> in place of a surname because generally the census taker did not write down the surname for each member of the family with the same last name. Really? Seriously? That sort of thing leaves me scratching my head. Of course, I am still indexing records in between doing arbitration. When I do index, I try to be very careful and mindful of how my transcriptions are viewed by the person who will arbitrate what I’ve done. I believe the biggest reason there are so many “oopsies” is due to indexers not reading directions or making sure the highlight is adjusted to the line that’s being transcribed. That being said, some of the census takers’ penmanship leaves a LOT to be desired! Spelling errors and such are forgiveable especially when trying to decipher some of those squiggles – such as lots of names crossed out and rewritten above what’s crossed out – looks like a 2nd grader has written everything! So to my fellow indexers and arbitrators – we can only do the best we can and be as conscientious as possible. Quality before quantity – and a prayer that we are reading it right doesn’t hurt! No, it’s not the countdown for Easter. No, it’s not how many days are left before tax filing is due. No, it’s the day after Palm Sunday. 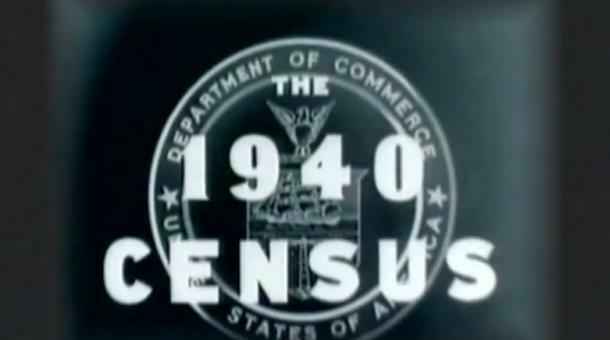 It’s the amount of days before the 1940 US Census is RELEASED – FREE!!! That would be images – not an index. How do we make sure the index is completed as soon as possible? We ALL step up and volunteer to index!!! You can go here. Just fill out the information and voila! You are registered! 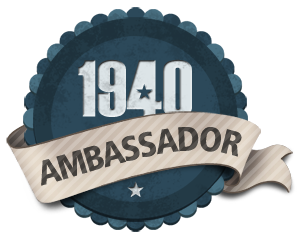 If you have a blog and want to promote the 1940s Census, you can sign up to be a 1940 Blog Ambassador. Just click on the registration link and sign up! I did! And I have this cool looking badge (above) to show that I’m an Ambassador! “I don’t have time index!” (What you are thinking to yourself, right?) If you have time to search – by Enumeration District – or Browsing through pages and pages of census records, then you do have time to index!!! Give it a try! Just index ONE PAGE. After you do that one page, someone else will also re-index in order for the arbitrators to check for errors and clarity. I guarantee that if you do one page, you’ll realize that it is not that time consuming and you’ll soon find yourself downloading another batch, or two (or more!). And if you download a batch and realize that there is just no way you can 1) read anything or 2) you don’t have time just then to index or 3) you don’t understand what to do – it’s ok! There are links you can use to get help – to fill out the index, tips on reading handwriting, or you can save your batch & work on it later, or send it back and ask for another batch. If you belong to a genealogy society – recruit the members to help index the 1940 Census. The more people who start indexing on April 2nd – the faster the complete index will be available!! !